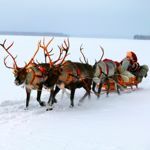 Lapland is magical year-round but add Santa to the Northern Lights, deep snow and husky sledding and it’s a child’s dream. 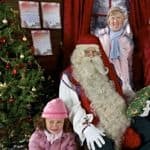 With regional flights and special offers for single parents, trips needn’t blow the Christmas budget either, despite packing in activities galore and a private meeting with the big man himself. 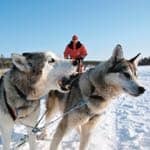 Lapland is one of the world’s truly magical places, where the snow lies deep and crisp and even, reflecting the shimmering wonders of the Northern Lights. It’s a place where anything seems possible and childhood dreams can become reality – what a wonderful treat for a single parent to share with their children. 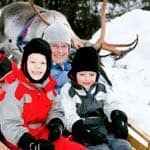 You can look forward to reindeer sleigh-rides, the excitement of husky sledding and snowmobiling, fun and laughter with Santa’s cheeky elves in the Igloo Fantasia experience, and the glittering charm of this beautiful winter wonderland. Best of all, you are guaranteed a private meeting with the big man himself, in his hideaway log cabin deep in the snowy woods. We have a special offer for single parents (and single grandparents!) at Santa’s Holiday Club. This four-star hotel is in a central village location and has a fantastic indoor pool with slides and chutes plus a children’s play area and free use of toboggans. Choose from a selection of two or three night breaks departing from Manchester, Gatwick, Edinburgh, Bristol or Leeds Bradford airports from £1,499 half-board for one adult and one child aged two to 11 years sharing a room. The price also includes thermal suits and boots as well as loads of fun activities.